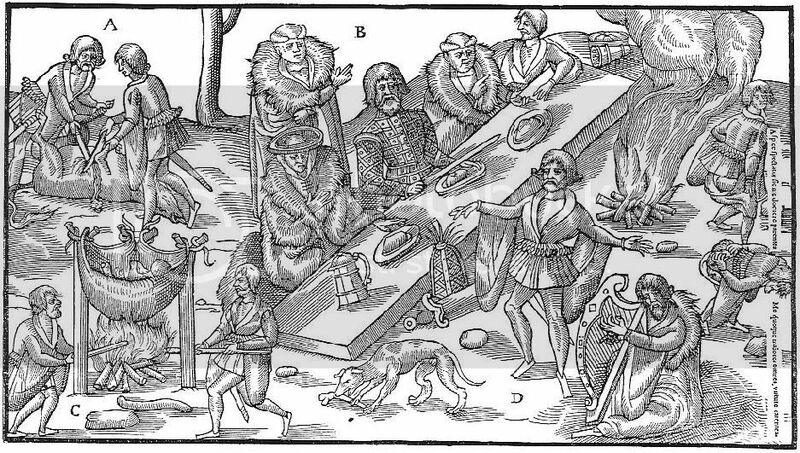 The following images are woodcuts that appeared in the book The Image of Irelande by John Derricke, and published by John Daye in London in 1581. 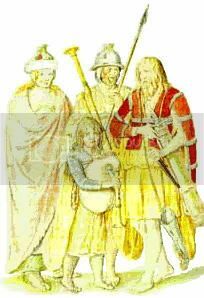 Derricke was believed to have been a retainer to Sir Henry Sidney & was an eyewitness to the events in Ireland during this period. While the book is most certainly Sassenach propaganda, it is considered by most historians to be an important work illustrating Irish costume and customs and the English military during the Tudor period. 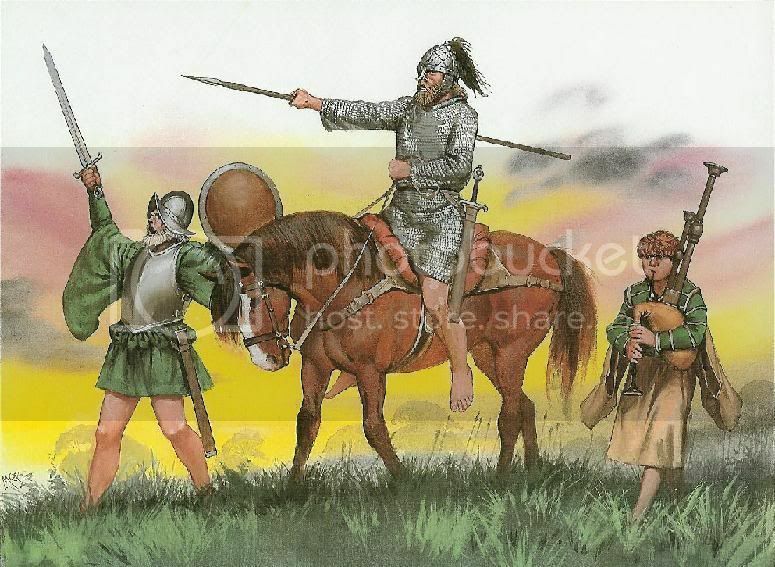 Also included are both period illustrations and modern interpretations of the Irish léine and of the warriors known as the Galloglass. 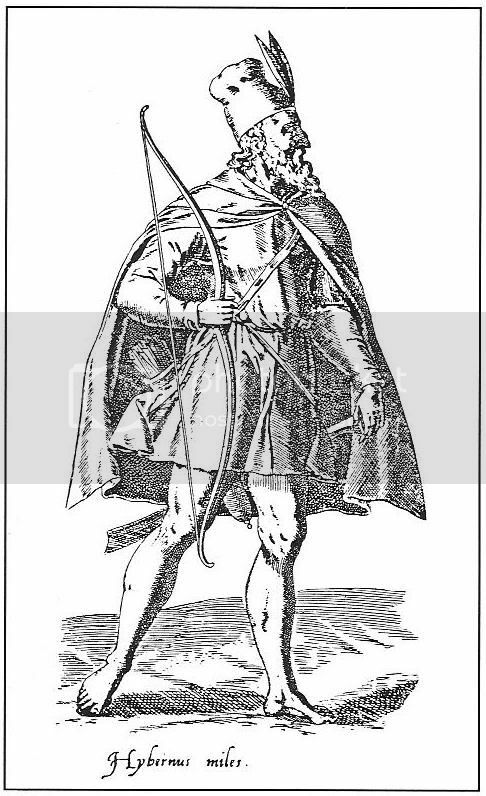 note: scans of the plates & additional caption descriptions appear courtesy of "The Irish Wars 1485 - 1603" (Osprey Man-At-Arms # 256) and appear in italics. To view an original copy of Derricke's book, see the link above. 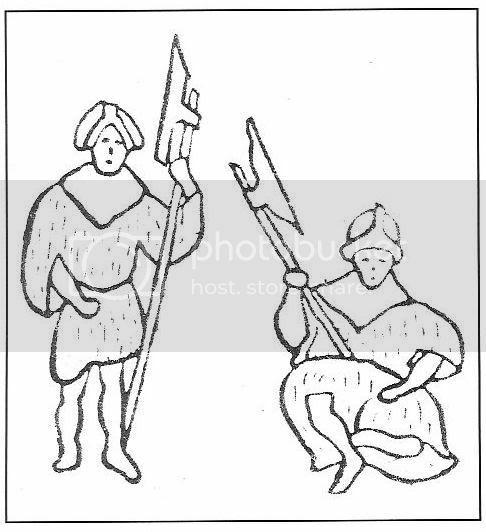 A soldier holding a battle-axe hands a spear to an Irish chieftain in full dress, with a page holding the chieftain's horse. Note the pillion saddle of the horse. The most famous plate of the set shows the chief of the Mac Sweynes seated at dinner and being entertained by a bard and a harper. The meal of beef is prepared in traditional fashion, being stewed in a cauldron made of its own hide. 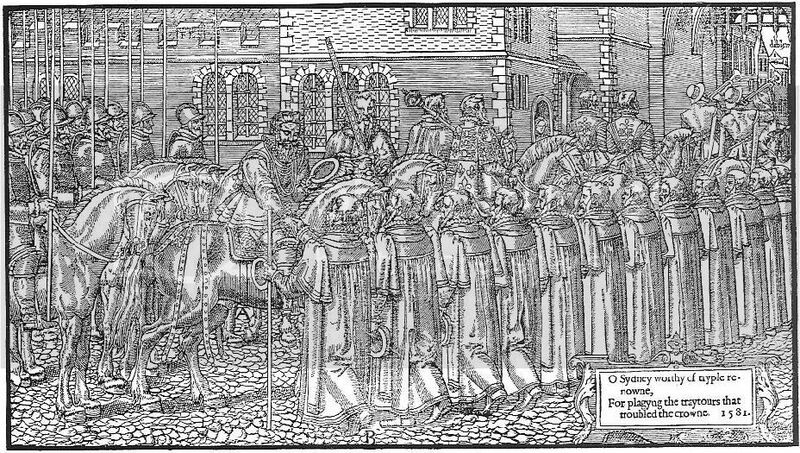 The Irish chieftain receives the priest's blessing before departing to fight the English, who are shown in full armour. 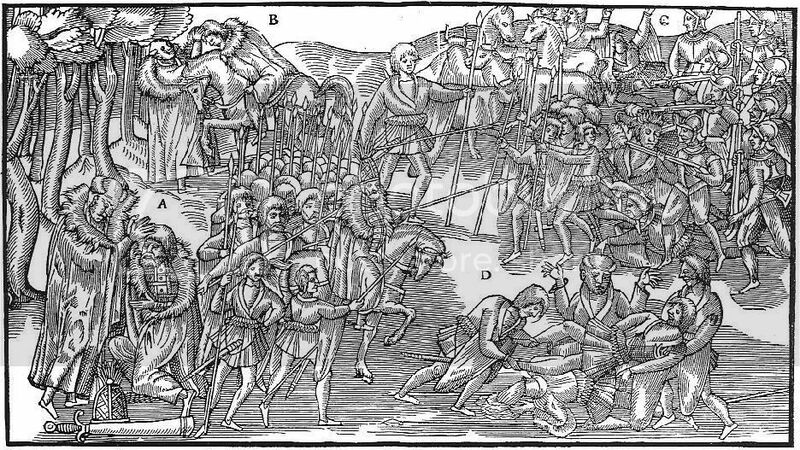 To the right the raiders are repulsed by English troops, who recapture the rustled livestock. The English solders return in triumph with 'liberated' livestock and Irish prisoners, carrying severed Irish heads and leading a captive by a halter. Note the adoption of Irish practice in the taking of enemy heads. 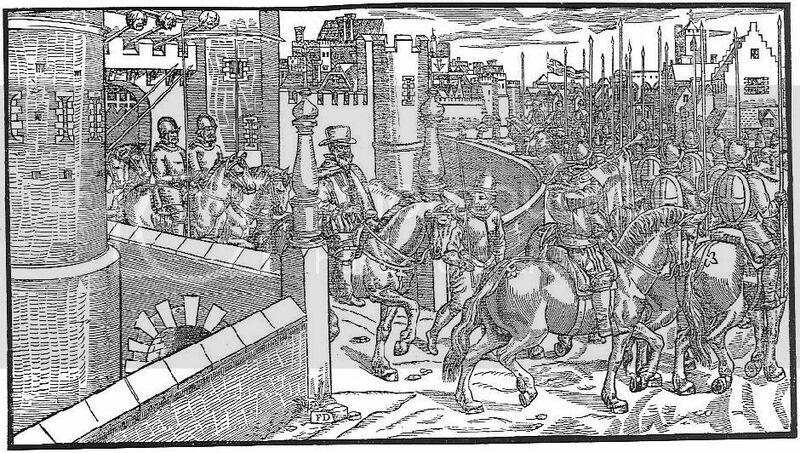 Sir Henry Sidney, Lord-Deputy, accompanied by an armed force, sets out from Dublin Castle for a progress through Ireland. Note impaled rebel heads above the gateway. Last edited by BoldHighlander; 15th January 11 at 01:26 AM. 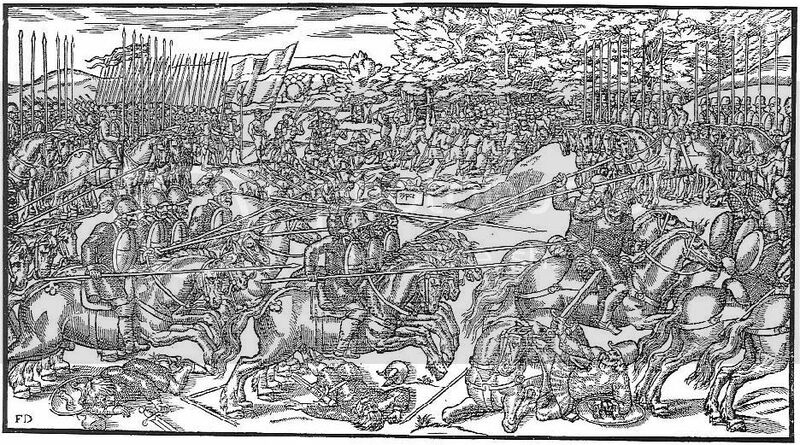 The English army is drawn up for battle, while Sidney himself parleys with a defiant messenger from the Irish. Sidney and the English army on the march with standards and trumpets, pikemen and shot in the foreground, demilances behind. The English army puts the Irish army to flight. The piper is cut down with his pipes beside him. Spirited action between English and Irish cavalry. In the background mail-armoured galloglasses flee into the woods to escape the withering fire arquebusiers. 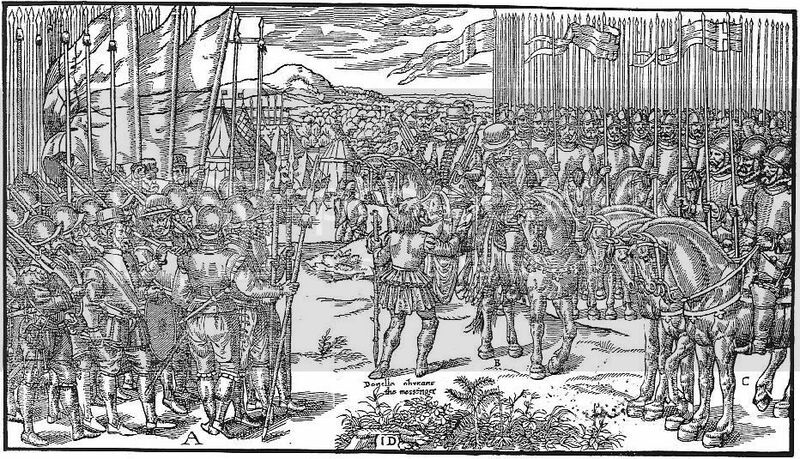 Sir Henry Sidney returns in triumph to Dublin Castle , April 1576, and is received by the Lord Mayor and Aldermen. Rorie Oge O'Moore, a wild kerne and a defeated rebel leader, in the forest with wolves for company. He was eventually killed by the kern of Barnaby Fitzpatrick, Lord of Upper Ossory, in June 1578. Turlough Lynagh O'Neale and the other kerne kneel to Sidney in submission 1575. In the background Sidney seems to be embracing O'Neale as a noble friend. 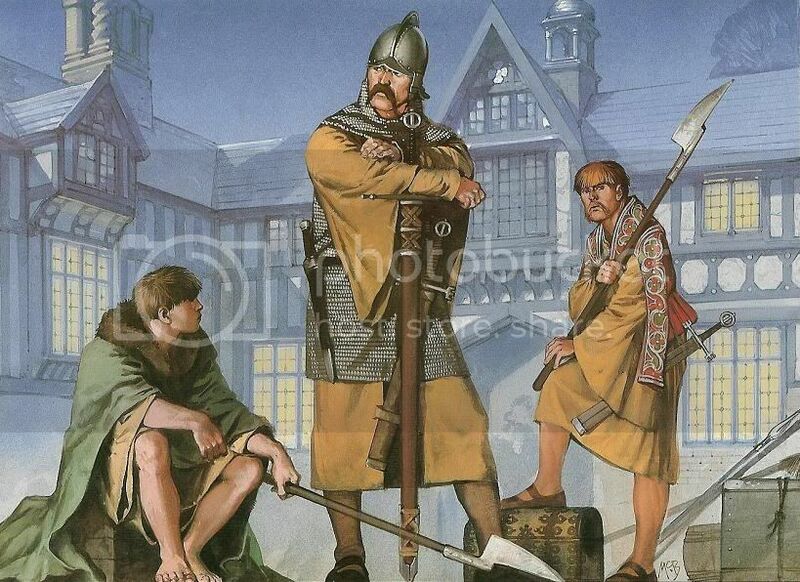 Note that O'Neale wears a native version of English costume and sports an English haircut, though his entourage still wears distinctive Irish costume. Crude rendition of MacSweeny galloglasses, from Goghe's Map of 1567. 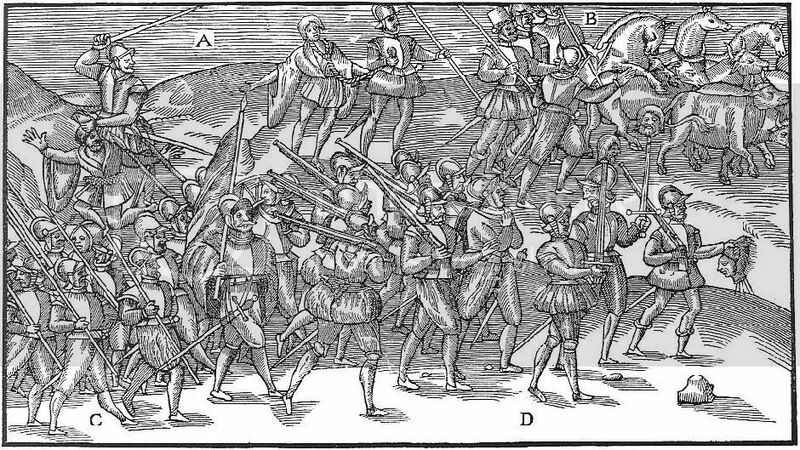 Woodcut of 1588 by Casper Rutz of an Irish soldier serving on the continent, probably one of the Irish auxiliaries who accompanied the Earl of Leicester's expedition to the Netherlands in 1586. 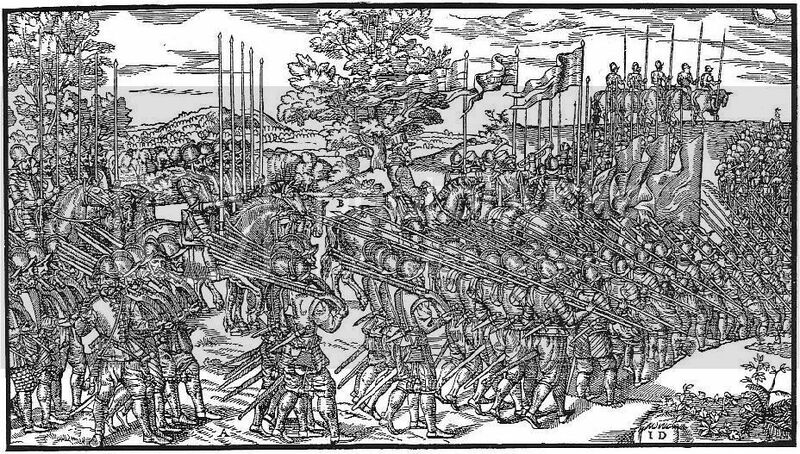 Woodcut from around 1550 of Irish men (perhaps soldiers or prisoners of war) all wearing long tunics with very wide, hanging sleeves, and short jackets called ionar. 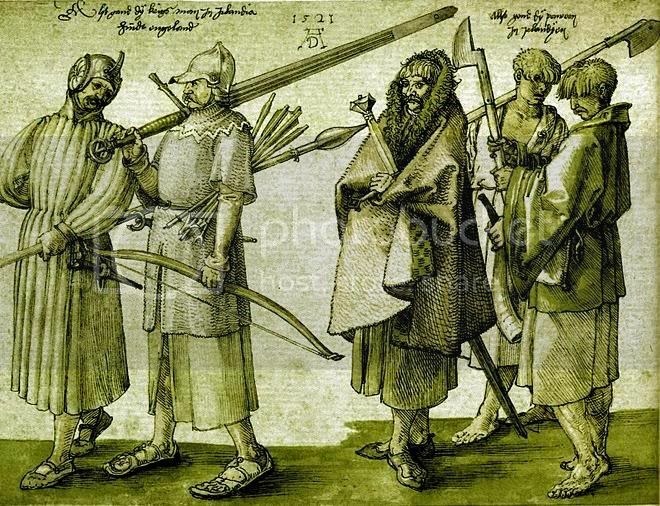 Five Irish soldiers (possibly Galloglass & their kern attendants) by German a artist named Dürer in 1521, that he presumably met on a stay in the Low Countries. 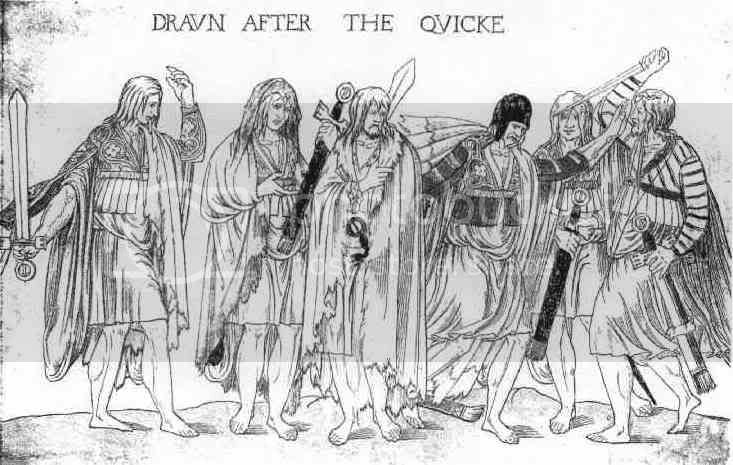 One is wearing an acton (“cotun” in Irish) but the other four are dressed in long tunics that reach midway between the ankle and knees. 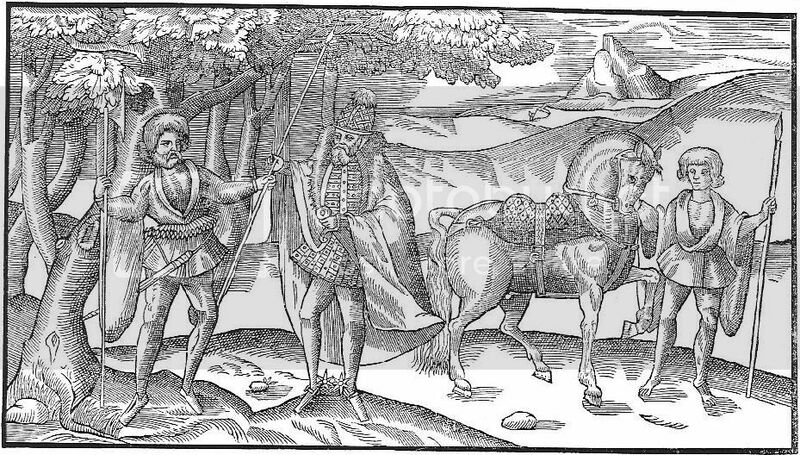 An Irish Galloglass (rear) & his kern - circa mid-1500's. A water-color painting found in a Dutch book from 1574 entitled Corte beschryvinghe van Engeland, Scotland ende Ireland. 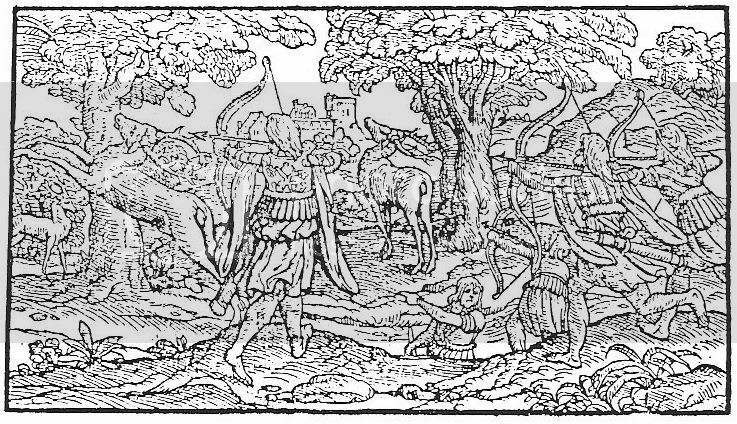 Woodcut of scotsmen hunting, from Holinshed's Chronicle, 1577.
barefooted and clad in mantles over their saffron shirts after the Irish manner'. 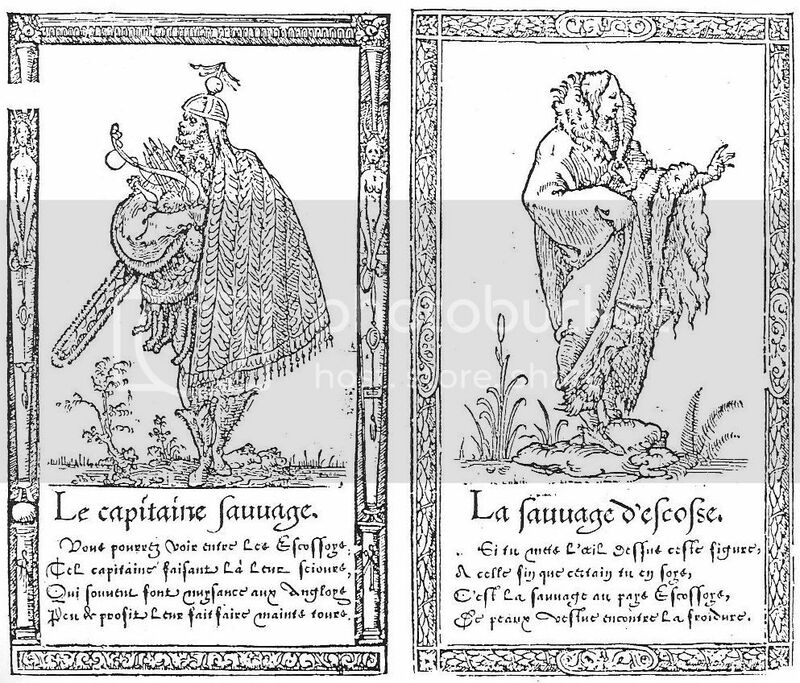 French woodcuts of 1562 representing Scotsmen. 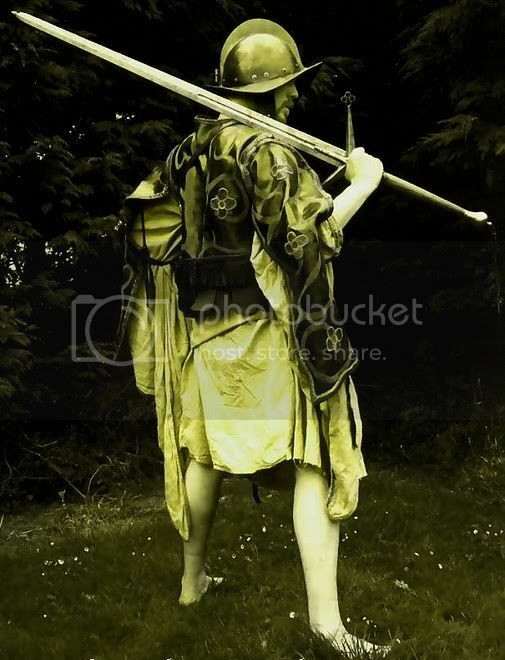 The capitaine sauvage is armed with claymore and bow, typical weapons of the 'New Scots' serving in Ireland. The other wears the enveloping 'shaggy mantle' that was common to both Highlanders and Irishmen. Captain Thomas Lee, circa 1594, when he was 43 years-old, by the Flemish artist Marcus Gheeraerts the Younger. It was probably commissioned by his cousin, Henry Lee of Ditchley. 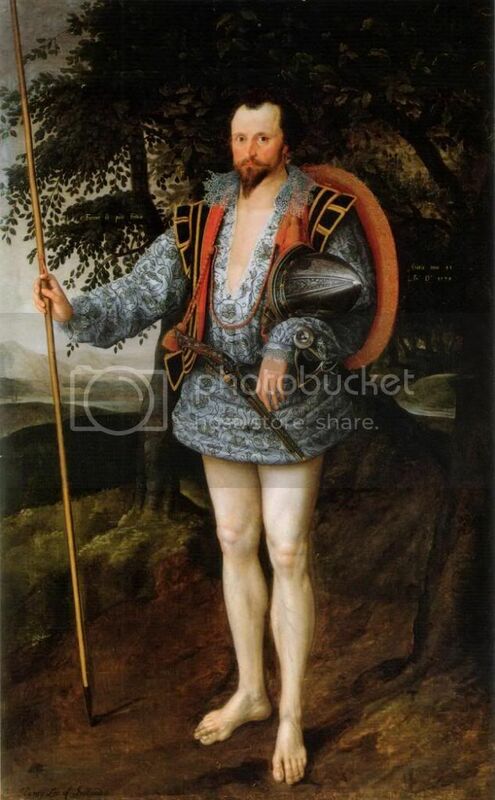 The subject is shown in the regalia of a captain of the Queen's Kern (a hybrid combination of English & Irish dress), posing with legs and feet bare, and armed with shield, spear and pistol. Lee served in Ireland continuously from 1575 to 1599. Though it has been suggested that his costume is fanciful rather than realistic, it is on record that some Englishmen genuinely did adopt Irish dress. John Vowell, for instance, records in 1586 of George Bourchier (Sir John Perrott's military adviser) that 'if he served upon foot he was apparelled in the manner of a kern ... and so light of foot as no kern swifter'. Note the characteristically Irish way he holds his javelin, with one finger through a leather loop which enabled it be twisted and spun in the hand. On April 28, 1956, the Coleraine Chronicle reported the discovery by a farm labourer of ragged clothing dug out of an earth bank on the farm of Mr William Dixon, in the townland of Flanders, near Dungiven, County Londonderry. The find consisted of a woollen jacket or jerkin, a small portion of a mantle or cloak, trews or tartan trousers, and leather brogues. 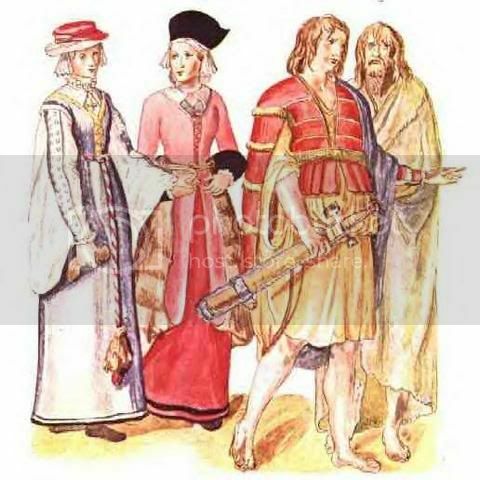 This was the style of clothing worn by men in those parts in the 16th or 17th century. Archaeologists from the Ulster Museum were invited to analyse the discovery. A block of peat containing fragments of the clothing was examined.....revealing a high concentration of pine pollen. Scots pine had been introduced into Ireland in the 1600s. The likelihood was that the tartan cloth was at least that old. The trews had been made up from tartan woven in the Donegal style, in strips varying in width and distance from each other. The remaining items were also subjected to rigorous analysis. Audrey Henshall (Edinburgh's National Museum of Antiquities) concluded that while the mantle was Irish, the trews almost certainly originated in the Highlands. The logical explanation was that tartan cloth woven in Donegal had been exported to Scotland. There the material had been made into tartan trews, which was the fashion in the Highlands. These trews started off as clothing for some wealthy person. When they unearthed in the soil at Flanders townland, the trews were covered in patches. The large variety of materials used indicated that the trews had been passed from one person to another, adding to the mystery. Reconstruction of the Dungiven Costume, a set of clothes discovered in a bog in the 1960s and thought to date to c.1600, the period of Tyrone's rebellion. It was perhaps originally the property of his O'Cahan soldiers. The trousers are of a tartan cloth cut on the bias, while the jacket resembles that of Turlough Luineach O'Neill in Derricke's print. The semi-circular woollen mantle is 8 1/2 feet wide by 4 feet deep. 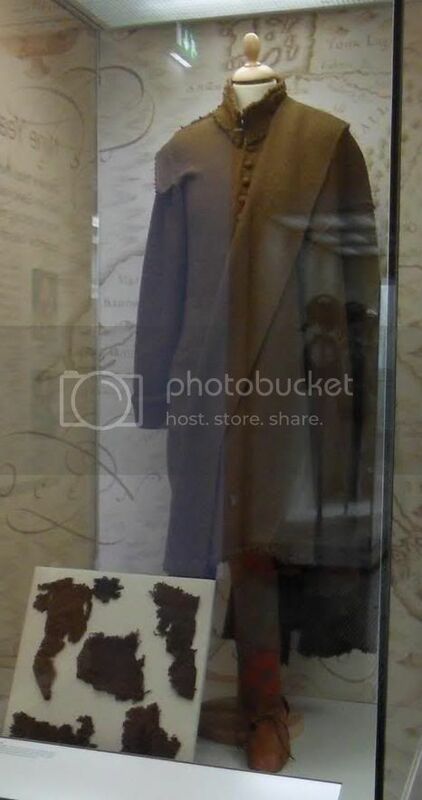 The photos are of the reconstructed Dungiven bog clothing at the Ulster Museum, Belfast. 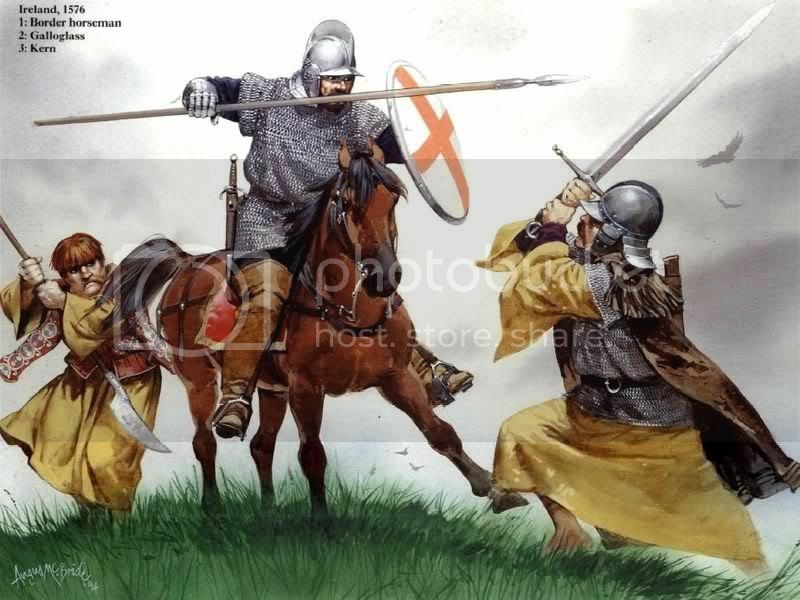 The following illustrations are by renowned military history illustrator Angus McBride. 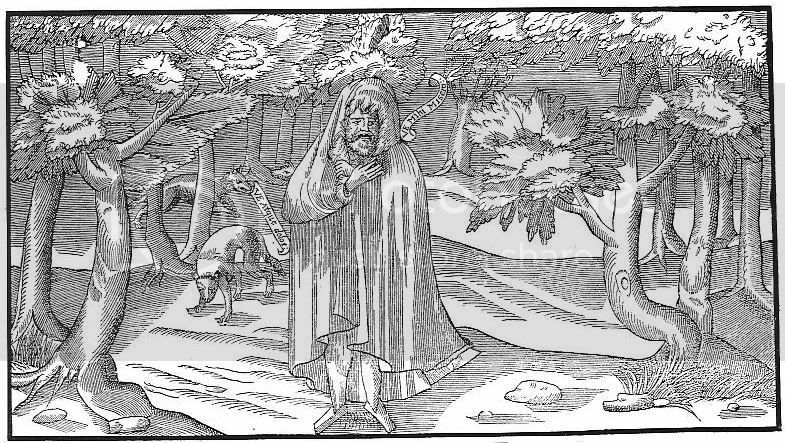 A Galloglass and the kern - circa 1562. To the English, Ireland was one of the frontiers of Europe, a land on the edge of their world, full of barbarians. It is little surprising then that the courtiers of Elizabethan London observed O'Neill's retainers with 'as much wonder as if they had come from China or America,' according to a contemporary chronicler. Indeed, the Celtic party, headed by The O'Neill, presented a fantastic sight. In defiance of previous Tudor legislation, his warriors were wholly Gaelic in appearance. Their hair was long: fringes hanging down to cover their eyes. They wore shirts with large sleeves dyed with saffron, short tunics and shaggy cloaks. Some walked with bare feet, others wore leather sandals. 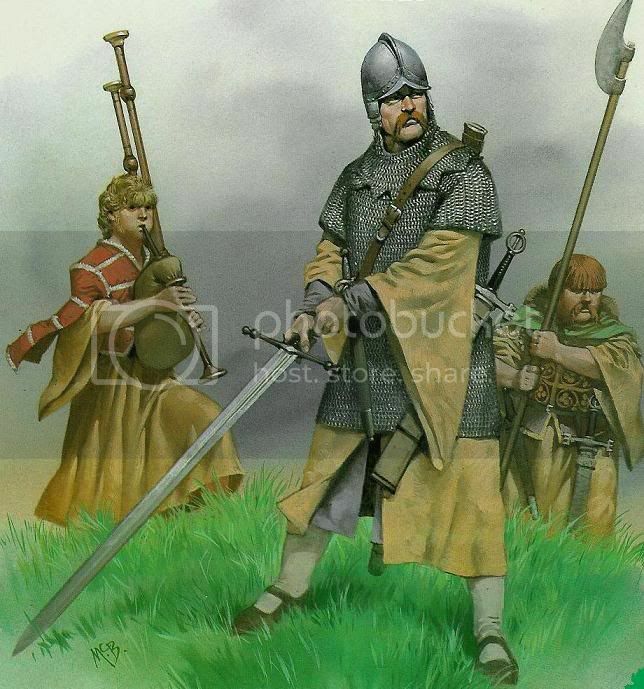 The galloglas carried battle-axes and wore long coats of mail. -- from Celtic Warriors 400 BC - AD 1600 by Tim Newark. 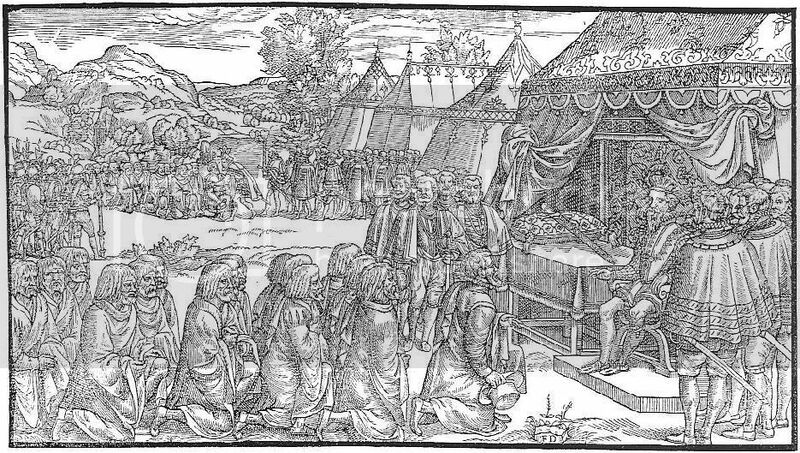 A Galloglass and his kern attendants await their Irish lord, Shane O'Neill, during his visit to the court of Elizabeth I, London, 1562. 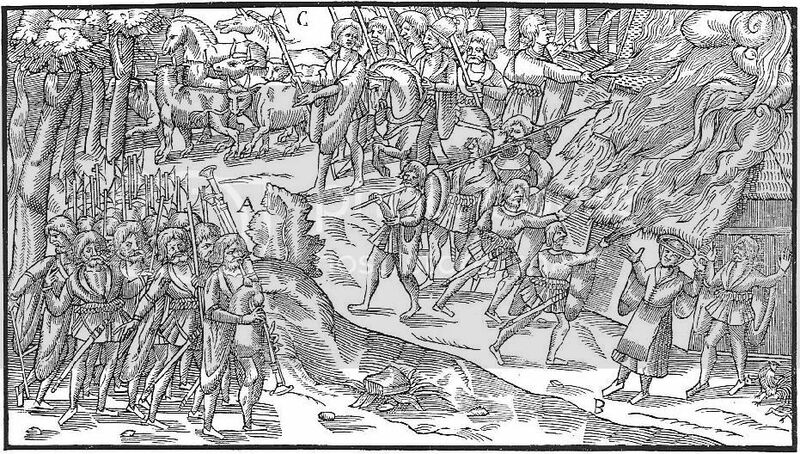 A Border horseman in Ireland battles a Galloglass and a Kern (1576). Irish warriors of the army of Hugh O'Neill charge upon the English at the battle of Yellow Ford, Ulster, 1598. A modern recreation of an Irish Kern by a member of Claíomh (meaning 'sword' in the Gaelic) a military 'living history' group based in Ireland. Finally, to read more about the Léine see this online article authored by our own Matt Newsome. Last edited by BoldHighlander; 15th January 11 at 07:00 PM. I'm not really sure whether one can identify any such thing as a Donegal style of tartan and I find it fanciful to assume that if the cloth were indeed woven in Ireland that it would need to be sent to Scotland to be made into trews. I am unfamilar with any accurate/authorative evidence to support tartan weaving in Ireland during the early 1600s and it's equally possible (probable?) that the material was woven, and possibly made up, in Scotland. We don't even know if the wearer was Irish or one of the Galloglaass. The latter would certainly be logical. Does anyone have access to Audrey Henshall's article? While it would be nice to see more evidence and the like I can't see a tartan like material being made in Ireland and then exported. Many areas independently produced tartan pattern cloth. However I do agree that according to the evidence thus far it is the less likely. Also, thanks boldhighlander you put in a lot of work posting all that. This reminds me of a Shakespeare quote from Macbeth which is close to my heart. Of Kerns and Gallowglasses is supply'd ; "
Would flopping this image be proper?